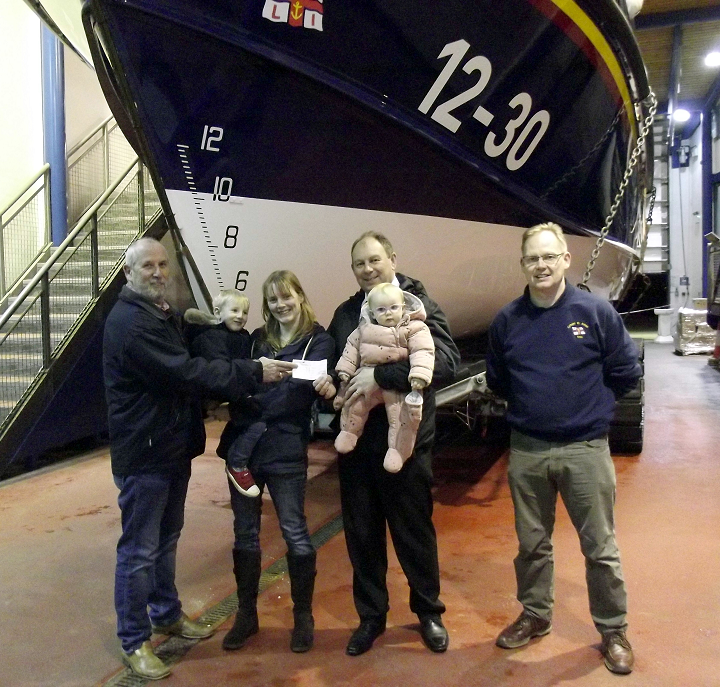 Post Master Chris Roberts and his wife Laura visited the boathouse with their two children James and Sophie to present a cheque for their first year’s donations to the Appeal Fund. They were thanked and shown over the lifeboat Her Majesty the Queen by Appeal Chairman Digby Moulden and crew member Mike Gee. Young James’ great, great, great, great grandfather was Coxswain Thomas Rimmer who served in the Lytham and St Annes lifeboats for over 50 years.Tom was a member of the Lytham lifeboat crew that put out in December 1886 to the German barque Mexico, wrecked in the Ribble Estuary. In attempting to reach the wreck the St Annes and Southport lifeboats were overcome by the force of the sea and 27 brave lifeboatmen lost their lives in what is the worst disaster in RNLI History. Only two members from the Southport boat survived and the entire crew of the St Annes boat died. 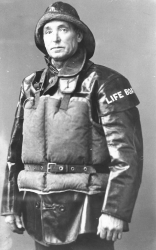 The Lytham Lifeboat saved the twelve crewmen from the Mexico, despite the terrible conditions at sea that night, and brought them safely to Lytham in the early hours of the morning. As an experienced lifeboatman, Thomas Rimmer was then asked to become Coxswain of the new St Annes crew formed to replace the lost men and so transferred from the Lytham boat. He was awarded the RNLI’s Silver Medal for gallantry for saving the crew of the barque Albert William in 1888 and carried on as Coxswain until he died peacefully in his sleep at home in 1920 after 33 years in command of the lifeboat. With the closure of the St Annes lifeboat station in 1925, Thomas’ sons Edward (“Teddy”) and Hugh (“Boxer”) transferred to the Lytham lifeboat, Edward eventually becoming Coxswain and Hugh 2nd Coxswain in 1941 until their retirements after the war. The annual Lifeboat Fun Run “Leg It for the Shannon Lifeboat” is the next fund raising way to help the Appeal and will take place on Sunday 14th May 2017. Further details are available on by clicking here, or from the posters in the station’s two boathouse souvenir shops on Central Beach and South Promenade.